The homebuilder is offering part exchange on selected properties at St Thomas Priory in Baswich, an intimate semi-rural development in a private courtyard, just a few miles from Stafford town centre. With three and four-bedroom homes almost ready to be occupied, sellers could soon become buyers and make a quick and easy move from old to new. Sales director Marie Morris said: “Analysis from home.co.uk suggests that it takes almost three months from a property in Stafford coming onto market to reaching a sold status; while unsold properties have been up for sale for more than four months. We appreciate that once someone has decided they want to move they want to do so sooner, rather than later. With that in mind, we will consider taking a customer’s home in part exchange towards the cost of a brand new home. 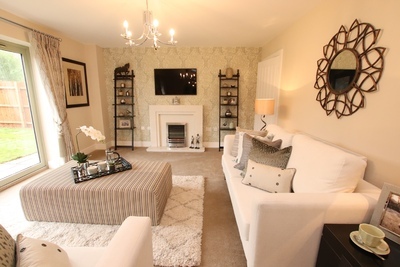 Prices at St Thomas Priory range from £234,995 to £434,995. Among the homes available with part exchange is the four-bedroom Fulford, priced at £369,995. It offers 1,486 sq ft of well-planned living space with an open plan kitchen, dining and living room at its heart. There’s also a separate study and a convenient cloakroom. Upstairs, the master bedroom benefits an en-suite and dressing room, leaving the family bathroom to serve the remaining three bedrooms. The specification includes modern fitted kitchen, well-equipped with oven, hob, microwave and fridge freezer; contemporary white bathroom suites with chrome taps; plus high efficiency gas central heating. For more information about St Thomas Priory see elan-homes.co.uk/stthomas.